He started his acquaintance with violin-making in 1969, studying under Master Pietro Sgarabotto and graduating from the International School of Violin-Making in 1973. He then specialized in the restoration of bowed instruments in various workshops abroad. Since1977 he has been teaching at the School of Violin-Making. He restored instruments of famous makers and those owned by well-known musicians such as Paul Tortelier and Felice Cusano. Since 1993 he has been publishing a year book containing the pricing of bowed instruments sold in auctions all over the world. 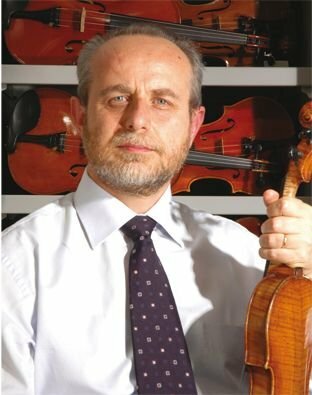 He also published the books Caratteristiche degli strumenti ad arco bresciani (1990), Il violino bresciano di Ole Bull (1992) e Strumenti musicali dal XVI al XVIII secolo (2004). He was invited to attend conferences and seminars throughout the world, including in Romania, Venezuela, Norway, Finland, South Korea, Canada, Singapore, Brazil, France, Portugal, Cuba, Switzerland and Mexico. He compiled the new catalogue of bowed instruments for the Museum of Musical Instruments in Milan and implemented cataloging work for many other Italian collections. He has written many articles for exhibition catalogues and is a consultant for the courts of Milan and Cremona. He was a member of the scientific committee of the exhibition La liuteria lombarda del ‘900, (Cremona 2002) and was the curator of the exhibitions Per gli occhi e ‘l core, (Corte Franca 2004) and Strumenti musicali dal XVI al XVIII secolo, (Brescia 2004).